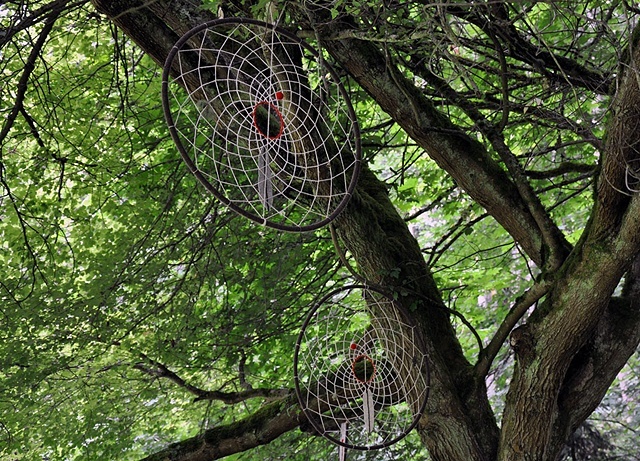 Detail view of installation of three dreamcatchers and three feathers at Carkeek Park in Seattle. Artwork is part of "Rootbound: Heaven and Earth IV" and will be on display through October of 2012 and is free and open to the public. Show is managed by Center on Contemporary Art Seattle, with support provided by the Carkeek Park Advisory Council, and Seattle Parks and Recreation. The three dreamcatchers have bases of plastic tubing wrapped in wool yarn. Wool yarn is also used for the webbing and for the red felted balls and red detailing on each piece. Embellishments include wool felt feathers, brass bells, pinecones, lichen, and glass beads. All three are hung in the same tree, with two dreamcatchers and two single feathers hung on one side and the other dreamcatcher and feather hung on the opposite side.